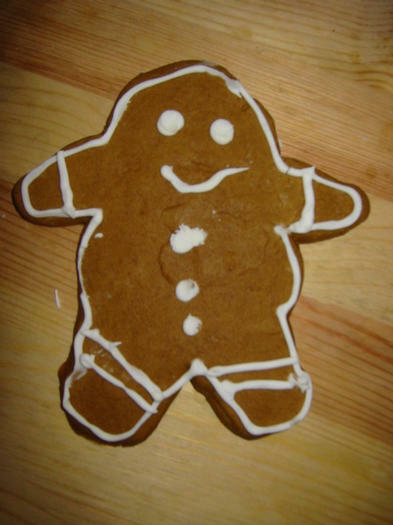 These are great for eating and shaping into Gingerbread people. 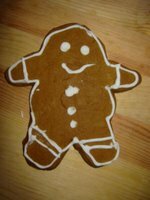 What is Christmas without gingerbread men. I hear that these are Santa's favorite. This recipe comes direct from the North Pole. Add a glass of milk, go to bed early and if you have been good all year, I think you'll have a pleasant surprise when you wake up. Blend sugar, shortening, molasses and water. Stir in remaining ingredients. Cover and refrigerate 1 to 2 hours. Heat oven to 375 degrees. Sprinkle cloth-covered surface with flour. Roll out dough with rolling pin 1/4" thick. Cut with a gingerbread man cookie cutter. Place on ungreased cookie sheet.Bake 8 to 10 minutes. Cool. Remove from cookie sheet. Decorate. Makes about 1 dozen. What a treat. One of my favorite charaters is living up to its name. I guess the people were tired of listening to the gingerbread man being devoured by the fox. It is now time that the creator gets his share.